When you press the key for middle C on a synthesizer keyboard, you always get a middle C. No big surprise there. However, depending on which combination of presets, filters and wave envelopes you select that middle C might sound like a grand piano, a Trinidadian steel pan, or some Martian marimba no one has ever heard in their life before. These amazing sounds are created and crafted by sound designers—sometimes musicians, sometimes passionate audio enthusiasts, and occasionally electrical engineers and sound designers with a specialization in signal processing. Like Dr. Stéphane Pigeon. Dr. Pigeon lives in Brussels—where he was born. He’s a serious scientist, and a high-level audio technician. He worked at the Laboratoire de Télécommunications et Télédétection at the Université Catholique de Louvain, initially optimizing MPEG2 codecs, then working on multimodal biometric person authentication. Eventually he signed on as a researcher for the Royal Military Academy working on data fusion, channel coding and audio processing. Dr. Pigeon has also worked as a consultant for the Roland musical instrument company in Japan, designing sounds for their high-end synthesizers. And he’s built a number of audio-related websites—including one for testing your hearing. But what really interests Dr. Pigeon is ambient sound. Soothing, comforting, calming sounds from the world of nature. Running brooks, distant thunder, falling rain. Sounds that mask a noisy office environment so you can concentrate on your work. Sounds that lower your stress and increase your feeling of well-being. Sounds that can be precisely customized to compensate for hearing loss, or limitations in your audio playback technology. One of his web sites, myNoise, currently offers more than a hundred unique examples: Tropic Rain, Tibetan Choir, Coastline, Waterfall, Canyon, Ice World. 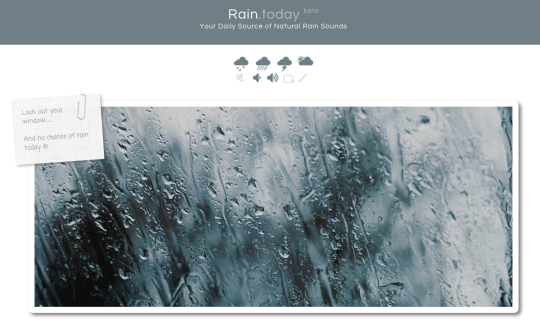 And he’s just started a new site, Rain.today, with a unique sound engine optimized specifically to play the best rain sounds on the web. He employs a bank of random number generators to program a rain sound that changes constantly, just like the real thing. Best of all, you can put your wallet away. Although Dr. Pigeon will happily accept donations, his ambient sounds are mostly free. What kind of business model is this? Tinnitus, or ringing in the ears, afflicts millions of people. For some it’s a minor annoyance. For others it’s a nightmare. For many years, one of the standard treatments for tinnitus has been the use of white noise—either to mask the ringing, or to keep the ears from ringing in the absence of sound. This technique doesn’t work for everyone, but it’s effective in many cases. Unfortunately, until recently, deploying white noise has been an expensive experiment. His challenge was to create something different from what other web sites offered—and one big difference was a ten-slider equalization feature that allowed users to customize the sound for their own ears. Within a few weeks, myNoise’s white noise generator was one of the most popular on the internet. As it turns out, rain sound is perfect for creating such an illusion. It can mask annoying sounds, then be ignored itself. All the sounds on myNoise have been selected and optimized to achieve this same effect. When Dr. Pigeon created myNoise in April, 2013, he was a successful freelance consultant with two full-time day-jobs. Money wasn’t a problem, so he decided to make the site listener-supported, like your local PBS radio station. This, as it turns out, was not only karmically correct, but profitable too. Now that myNoise is a profit-making business, what’s the next step in Dr. Pigeon’s business plan?